"The Mammoth March Impossible has potential to be most challenging and demanding ultra endurance race in Finland, specifically for runners. 170 km (closer 190-200 km for cyclists) distance is not that long for cyclists, but there are other elements that can make it really hard endeavour: start in the evening at 20.30 and consequently riding through the night in pitch darkness with sleep deprivation, orienteering that requires concentration, possibly adverse weather conditions of Finnish late fall. And that special swimming checkpoint in cold water. So, it's not just a long, long orienteering race. It's very much an adventure race." This year we had a new member in our team, Tommi, so it would be four of us. Many weeks before the race I knew that this year's race would be difficult for me because of the shifts in my work. I would be in morning shift week, and I didn't have the luxury to take a day off from work. Sleep deprivation would be a big concern. But I thought that doing fairly hard evening shifts from July would help me, and it would be a good test how much deprivation I can handle. Like in earlier years, Peter and Jarkko was doing the work with the maps and route planning. This year's location was around Vihti and Nuuksio. I had a new role of taking care of the logistics, by driving the car and planning transportation of our bikes. There was a little setback with this, as I couldn't fit an affordable rooftop rack on my car, and this forced Tommi to take his car too. My bike for the race, 9:ZERO:7 2011 model converted to 29er with full coverage fenders. Thursday-Friday night was short, and I slept only 4,5 hours. I woke at 5AM and had everything ready for the race. I was feeling surprisingly good and was really pumped, excited and optimistic for the race start in the evening. We arrived well before the start in Otalampi, the race center. There was some late hassle with preparations, but nothing too bad. After the start we did immediately first orienteering mistake, but fortunately it wasn't a bad one. At the same time I noticed that I forgot some of my energy supplies in the car. But this wasn't a problem because rest of our team had some extras and there was a gas station later in the route to shop resupplies. Another surprise was that against all the weather forecasts, it was raining slightly with a temp around +2°C. Forecasts were looking for temps just below freezing later in the night and morning, so this was alarming if roads would get icy. Jarkko managed to collide slightly with Peter in one intersection, and fell second time when we entered a muddy trail. Fortunately those falls were innocent without any injuries. In the early part there was also a slightly funny mission checkpoint, where you had to calculate an amount of water and pour it with buckets. Jarkko handled it fast and succesfully and we were again quickly on the move. 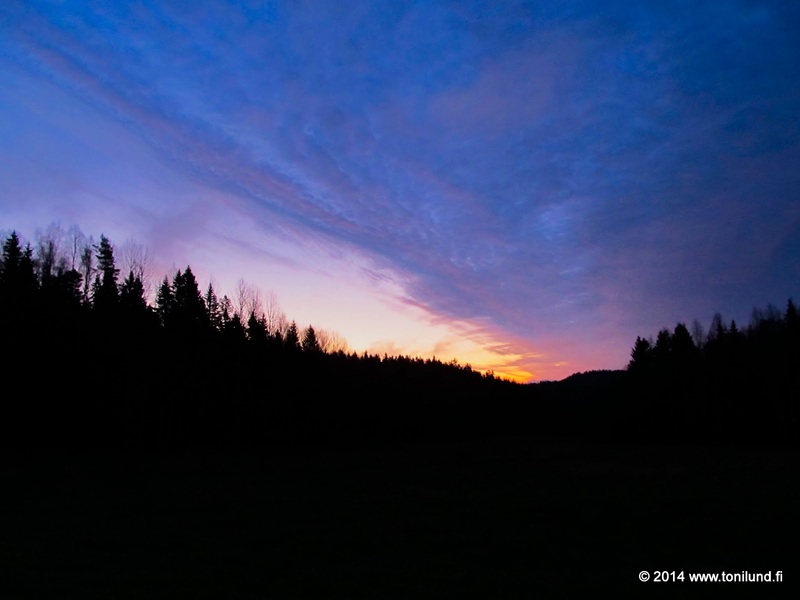 Around midnight I had first symptoms of sleep deprivation and I started to feel tired. I have never before had this problem this early, but with the circumstances, it wasn't a surprise. I drank soon first of my two Battery energy drinks. It helped a little. We did another small orienteering mistake around this time. I felt better on the hiking checkpoint, but after that sleep deprivation hit very hard. My body and mind really wanted to shut down. But I was still determined and was thinking that eventually this bad phase would go away. My team was concerned at this point. Every time we stopped to check maps and our position, I leaned against my handlebars and almost fell every time as I was ready to sleep. I don't remember much what I said to my friends but they said afterwards that I was quite disoriented. Peter gave me two sandwiches and I drank another Battery. Eating helped slightly but Battery had no effect at all as we headed to Nuuksio. Nuuksio was a hilly place and my problems continued. We did also another small orienteering mistake here. My slow pace started to slow our team. My bad phase with sleep deprivation just didn't go away, it got worse. My riding on the hills were slow and constant twisting, and I was close to fall a couple of times. We discussed the situation. It was 05.15 in the morning and we had done 100 km, so we were around halfway point. I still wanted to continue, and said that probably this bad phase would go away when the sun rises. But this could mean that our pace is too slow for a 20 hour finishing time, and there is no guarantee what pace I can keep after sun rises. The cut-off time was 24 hours. So, we decided that I would DNF, ride back to Kattila which were only 2 km away, start a fire to avoid hypothermia (I didn't have down jacket with me because I really didn't think this kind of situation would happen) and wait for the 'corpse taxi'. I called the corpse taxi number, but for some reason, the number was wrong. 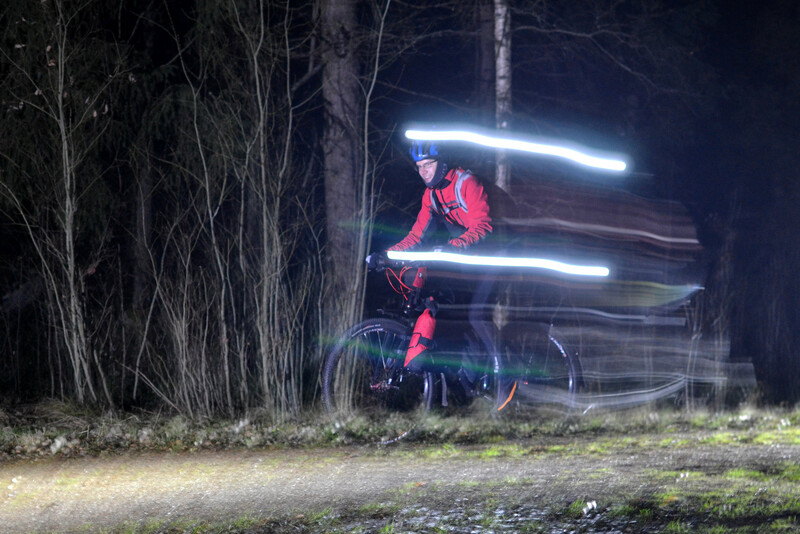 A man answered, but didn't understand as I told that I was from a team called MTB-Turku All Night Long. I asked that isn't this the corpse taxi. He answered that no. I apologised and called Tommi what happened. I also told that I didn't see a place for campfire. Tommi said that they will handle the corpse taxi, and there must be a campfire place. I found it on the other side of the area. The fire kept me warm and I didn't have any issues, other than being tired, as I waited for the corpse taxi. In the corpse taxi I felt disappointed, while it picked up two runners from other place and drove back to race center. I also slept for a brief moment. Back in the race center I went to sauna and shower. I figured out that a 30 minute nap on the race course would have been pretty much enough and I would have continued to the finish without any significant problems. I did that in Rovaniemi 150 back in 2013. After sauna I ate and slept for a while on the hard floor of the race center. Then I waited for my team and Matti who was running 100 km March. Matti came after 18 hours, congrats! It took a little over 20 hours for my team to finish! 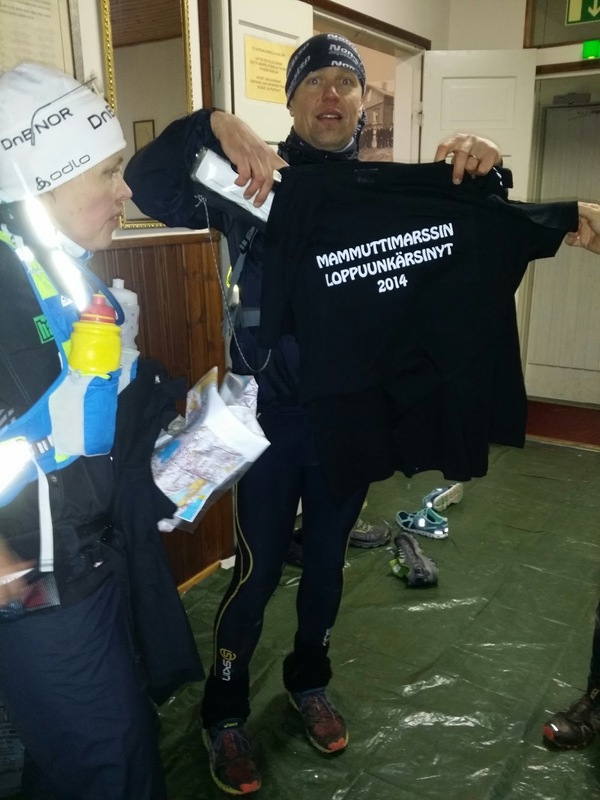 On the T-shirt it reads "Mammuttimarssin loppuunkärsinyt 2014", which translates "Mammoth March suffered to the finish 2014". Naturally I'm very envious to not have that shirt, but huge congratulations guys for doing it! They had some epic hike-a-bike sections and mechanical issues with a blown front tire and snapped chain. Although I'm disappointed, I learned a lot from myself and took a massive hit with sleep deprivation. A very good test indeed. This is now a factor that I have to pay attention to when I'm racing ITI on March 2015. I'm even more determined as I train and prepare for that monumental race of my life so far. The news is also that next year will be 10-year anniversary of Mammoth March, and there will a couple of newnesses as well. I will definitely be back for that one! And thanks to Peräkylän Ponnistus for a great race again this year!